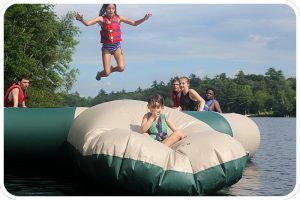 For over 80 years, Camp Quinebarge has consistently been ranked as one of the Best Sleepaway Camps in New Hampshire. Camp Quinebarge is the most accepting camp community in the nation. The campers, staff, alumni, and parents are one big family at Camp. 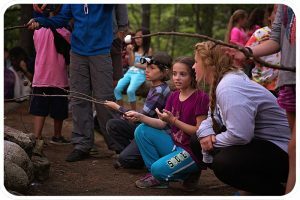 We find that our community, sports and waterfront are all reasons why Camp Quinebarge is the Best Sleepaway Camp in New Hampshire. If we had to explain Quinebarge to our parents in one word it would be friends; if we had to do the same with our campers it would be fun. Our parents love the everlasting friendships that their children make at camp. Camp has a community that very accepting and welcoming to new campers. 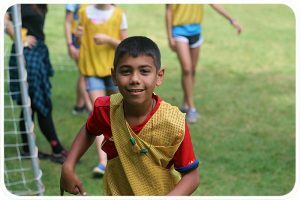 New campers are amazed at how fast they make friends at camp and how easy the transition from home to camp is. At Quinebarge we play all kinds of sports. From the traditional sports like baseball, basketball, soccer, flag football, tennis, capture the flag and archery, to some not so traditional sports like laser tag, awesome ball, a ropes course, and gaga. Our campers tell us how much they love the wide range of sports. 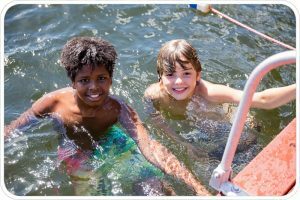 There is something for everyone at Camp Quinebarge! Our campers say if there is one place at camp they could hang out all day it would be our waterfront. Camp is located on the beautiful Lake Kanasatka. On our waterfront we have certified Red Cross Lifeguards and CPR first responders. Our waterfront has a lot of sailboats, paddleboards , canoes, surf bikes and funyaks. Everyday at Quinebarge we have an all Camp Swim. This means that all of Camp is on the waterfront hanging out and having a good time. General Swim is a consistent camper favorite from year to year. This year the waterfront is excited to announce that we will be featuring a Pontoon boat. We will have lots of tubing and boat rides to come in 2018!